HIS is a graphics card company that primarily builds ATI-based products. They are a Christian company as well. This is part of their company statement: HIS was established in 1987 with the mission to produce the highest quality graphic cards in the industry. Besides strong devotion to excellent products and services, HIS has been conducting business with the aim to "Glorifying God". Honesty and integrity are the two key principals of how HIS are conducted. Ethical business practice has been an everyday commitment to our clients, vendors, and investors. Most of us pick a video card based purely on chipset and price. It's good to see HIS is more than a typical ATI card manufacturer - they have a mission that CCGR can agree with. Even so, this review is based on the quality of the product reviewed; no unnecessary bias has gone into the review process. The HIS IceQ HD3650 is HIS & ATI's answer to the mid-range gaming market. For $150 it’s a good card that can allow you to play many modern titles and Blu-ray/HD video at 1080p. The video card has a heavy duty cooler on it, so it will require two slots. I’ll be comparing this ATI/HIS HD3650 against other Direct X 10 cards we have here. For our PCI-Express reviews, we have a fairly high-end system available. It should make fairly clear where the GPU limitations are, since we are not CPU bound here. The benchmark tools used for this review can be downloaded at www.guru3d.com. This card performed admirably. The default resolution ran on this benchmark is 1280 x 1024.The GDDR3 memory helps, but the 128 bit memory still holds it back a little. It’s about 1.5X faster than the 2600Pro which has GDDR2 memory. With the detail at low this game is very playable on the 3650.Over 40FPS on the latest Unreal engine is nothing to complain about.It’s pretty likely that the FPS is capped to 60FPS, the 8800GT is a pretty powerful card and can probably go further.This benchmark was run at 1280x1024 with low detail, and 12 bots doing capture the flag. The resolution was 1280x1024 and DirectX 10 and 64bit performance was enabled..It’s a time demo benchmark based on actual game play. I wouldn’t recommend playing this game with the detail cranked. If you were to lower the detail, Crysis would be playable.This game is known to bring video cards to their knees; in order to run this game decently, you have to spend over $200 on a video card. Vista was happy with this card.It scored a 5.9 for desktop applications and got a 5.6 for gaming. 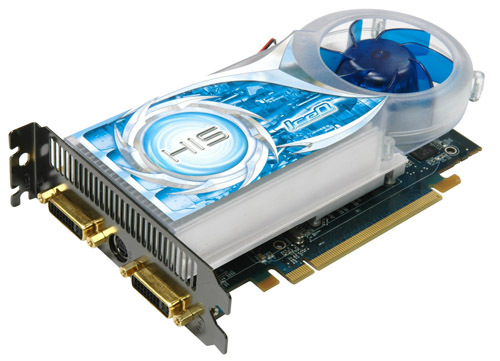 The HIS HD3650 IceQ Turbo is a good card for the money. I would recommend this card for gamers on a budget.I was happy to see this card running at the specs indicated on the box without the need for special software, unlike previous models.If you’re into case modding, the fan is UV sensitive and will glow with UV lighting in your case.Multimedia buffs will appreciate this card’s support for HD/Blu-ray video at 1080p resolution.Overall this is a good card for the money.